Tomorrow’s recipe is for White Chocolate & Plum Cookies. Put the butter and caster sugar into a bowl and mix well using a wooden spoon then beat in the egg yolk. Sift together the flour and salt into the mixture and stir until thoroughly combined. If the dough is too sticky, work in more flour until it doesn’t stick to your hands. Transfer half the dough to another bowl. Add the mixed spice and dried apple to one bowl and mix well. Shape into a ball, wrap in clingfilm and chill in the fridge for 30-60 minutes. Add the ginger and dried pear to the other bowl and mix well. Shape into a ball, wrap in clingfilm and chill in the fridge for 30-60 minutes. Preheat the oven to 190°C/375°F/Gas 5. Line 2 baking sheets with baking paper. Unwrap the apple-flavoured dough and roll out between 2 sheets of baking paper to about 3mm thick. Stamp out cookies with an angel-shaped cookie cutter and put them on the prepared baking sheet. Repeat with the pear-flavoured dough and stamp out cookies with a star-shaped cutter. Put them on the other prepared sheet. Bake in the preheated oven for 5 minutes then remove the star-shaped cookies from the oven and sprinkle with the flaked almonds. Return to the oven and bake for a further 5-10 minutes. Remove the cookies from the oven but do not turn off the heat. 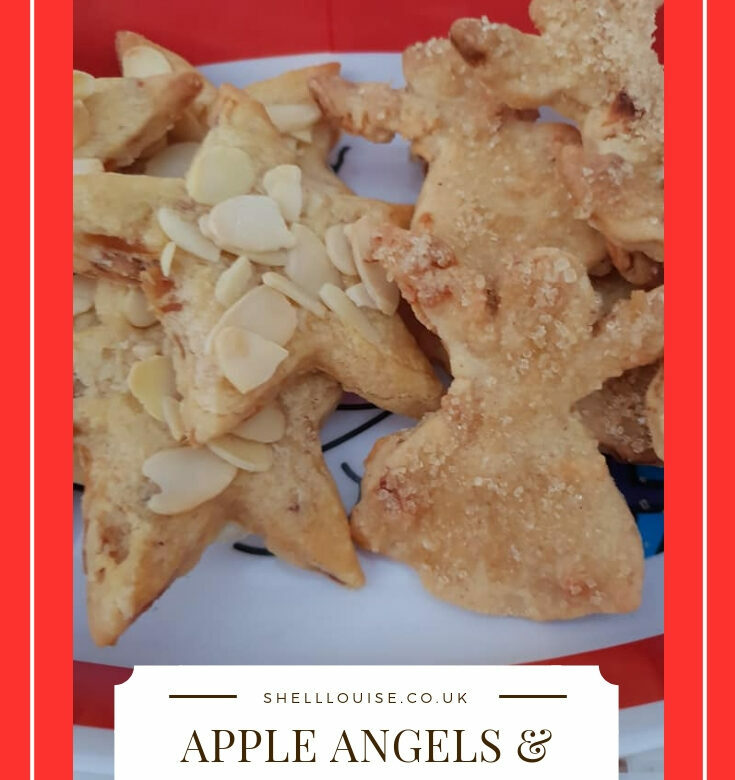 Brush the apple angels with a little egg white and sprinkle with the demerara sugar. Return to the oven for 2-3 minutes. Leave all the cookies to cool for 5-10 minutes, then carefully transfer them to wire racks to cool completely.